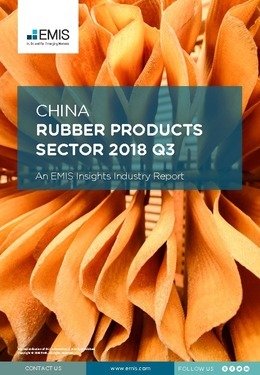 In the second quarter of 2018 the revenue of China’s rubber products sector contracted by 24.7% y/y to RMB 220.3bn, as a result of the decline in production and sales volumes. In this period, the sales revenue of the largest subsector – tyres – shrank by 26.5% y/y to RMB 119.4bn. The respective revenues of the second and third largest subsectors - rubber plate, hose & belting, and rubber accessories - went down by 21.4% y/y and 22% y/y, totalling RMB 29.3bn and RMB 19.8bn. § In Q2 2018, although the prices of major raw materials used in rubber products started to stabilise, the falling production and sales volumes of rubber products resulted in a 28.7% y/y decline in the sector’s total profit. This report provides a complete and detailed analysis of the rubber sector for China. EMIS Insights presents in-depth business intelligence in a standard format across countries and regions, providing a balanced mix between analysis and data. Build a clear picture of trends and issues for sub-sectors (e.g. tyre rubber products, rubber plate, hose and belting).